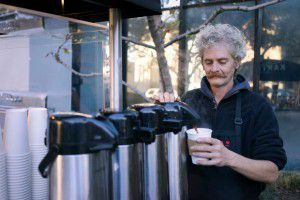 In San Jose, California there is a bright spot of hope for homeless people: a sidewalk coffee cart company. The baristas of Kartma are people who live in Silicon Valley, but even as prosperity in the valley boomed, they each lost blue collar and even high-tech jobs, and have been unable to find other work. All of them see their employment with Kartma as transitioning them back to having homes and other work. “Look, I’m moving indoors soon, and I’m shooting for saving every penny I can from what I make here so that in two years I can decide where I want to go next,” Hess said. “I might start my own operation. Who knows? Once again a universal concern can be approached by focusing locally. Kartma and their employees are making a difference, one cup of coffee at a time.